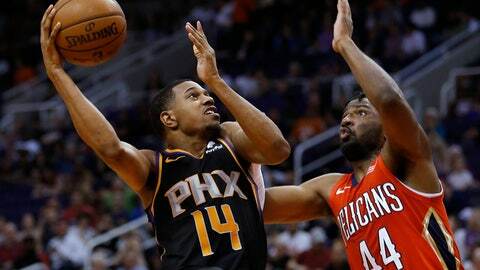 In the frenetic final seconds of regulation, De’Anthony Melton tipped in teammate Mikal Bridges‘ miss with 30.6 seconds to play to give the Suns a 117-116 lead. Pelicans: Former Suns player Elfrid Payton had 14 points and 12 assists. … F Kenrich Williams banked in a half-court shot at the first-quarter buzzer for a 38-31 Pelicans’ lead. … The Pelicans played their second overtime game against the Suns in less than a month, and lost both. Suns: Booker, shut down for the rest of the season after suffering a sprained left ankle in the Suns’ loss to Utah on Wednesday, took a seat in the back row of a baseline courtside seating section and watched the game from there. … Backup C Richaun Holmes sat out with a sprained ankle, which he rolled against the Jazz, but played through. … Suns fans began chanting “We want Jimmer!” in the third quarter, in reference to popular reserve guard Jimmer Fredette. Fredette never entered the game, but acknowledged the fans with a thumbs-up gesture.